The city of New York is often better known as the Big Apple and is one bustling town. New York is also called the City that Never Sleeps because there is always something going on here. Take a look below to see just a few of the things you can do on your next trip regarding hotels, shuttle rides for share ride vans and professional drivers for limousines. Travelers arriving at JFK airport can find many types of ground transportation to and from the terminals at the airport. With quick access to downtown New York City and Newark area you can find transfers for the airport with rates that is affordable. Providing transfers to and from downtown New York City hotels and resort this provider has consistent quality service for it passengers. This Blue Van service provided by SuperShuttle of New York offers shared ride van and private shuttle buses for travelers arriving at JFK airport. With pick up rides from Grand Central Terminal and nearby destinations the NYC Airporter offers some of the lowest rates in NYC. This service offered by SuperShuttle is a black car ride for those looking for something more private and luxurious when traveling between the JFK airport and nearby hotels. Travelers heading their way to JFK airport can book shuttle rides for a variety of rides to downtown New York City destinations. With a wide assortment of taxi, shuttle rides, luxurious limo or private sedans tourists can find discount transfers to almost anywhere in NYC. 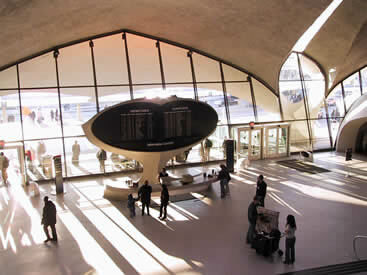 Situated on the Jamaica Bay, JFK airport is 15 miles from downtown area of Manhattan at the south-east of Queen County. JFK has had four different names none of them stuck as well as the John F. Kennedy. Layovers at JFK offer a variety of things to do both inside and outside. Being at close proximity to downtown Manhattan & also Brooklyn, it makes it an easy option if you have plenty of time on your hands. You could go into the city do some sight-seeing, grab a meal and head back to JFK. During the evening hours layover though, leaving the airport and getting stuck in evening rush hour wouldn’t be smart. To save time and have a good one too, go to the immediate vicinity i.e. Queens. You could take the A train through the Rockaway shuttle bus and bask in the beauty and peace of Rockaway beach. You could stroll around the lush green acres of Queens Botanical Gardens, which are accessible on bus lines connected to the JFK airtrain. There is a temple of the Hindu god Ganesh, if you are a vegetarian, you could get excellent veg food. If you have kids with you, bird watching could be fun too. Just get a taxi as the Jamaica Bay Wildlife Refuge is within the eyeshot of the runway. A beautiful sanctuary which has everything from salt marsh to upland wood, freshwater ponds. It is an interesting experience. It is better to use the time than just idling at the airport. New York John F. Kennedy International Airport flies out over 800 airplanes every day, making it one of the busiest airports on earth. Avoid getting stampeded after you step foot on the airport by reserving a shared ride van from us, allowing you and your friends to get to your hotel as soon as possible. With baggage handling and a driver that knows the streets, you’ll not only be riding in absolute comfort, but with a mind at ease as well. New York is one of the most historic cities in the country – with famous American icons like the Statue of Liberty and the 103-story Empire State Building, a structure that comes with its own observation deck, there’s plenty to check out. See spots like these and some less grandiose by scheduling a private van for your travels. Book a ride and head out to one of the city’s most famous landmarks like the American Museum of Natural History, a facility famous for its natural wonders. Although the big apple is known for being loud and rambunctious, you can still find quiet parts of the city without having to look too in depth. Reserve an individualistic private sedan and take a comfortable, quiet ride to Central Park. Take a stroll through the massive urban recreation area that over 40 million people visit every year and be sure to bring your child in case there are any fun events being hosted, which at Central Park is almost every day. For families looking to get the most out of their big-city visit, a common suggestion given to tourists is to not only reserve a private vehicle, but also an SUV. You can do this by contacting us of which offer top-of-the-line vehicles made perfect for getting to areas still in New York, but slightly out of the way like Coney Island. Drive over to the beach amusement park and eat a corndog on the famous Coney Island Ferris wheel, giving your family the memory of a lifetime. Visualize yourself in the heart of Manhattan, brushing shoulders with New York royalty as you eat celebrated French seafood at Le Bernardin. Now envision yourself arriving to the restaurant in a luxury stretched limousine, blending inasmuch as the bright city lights. Schedule a slick ride by ordering your own limo, getting to other fancy locales like Apotheke, a cocktail bar that’s famous for its apothecary theme. There’s almost too much to do in New York, and because of that there is almost never enough time, which makes the city perfect for second, third, or even fourth visits. For large groups looking to have a memory together, schedule a chartered bus and take a ride to Madison Square Garden for an iconic show, whether it is a music concert or an adrenalin-fueled sports game. To make sure your vehicle is ready and available, contact us for a pick-up/drop-off time. With so much to do in New York City tourists will discover that there is no shortage of things you can do during the day and night including some of the most unique nightlife you’ll encounter. Visit I love New York and search for the best restaurants, things to do and attractions throughout the city. If you are looking to spend a exciting and fun filled day in the city then New York is right for you. With a high energy atmosphere New York City has it all. When booking for rides from the airport you can find a large selection of ways to get to your destination. There are a variety of limo and sedan transfer available for just about any destination or trip style you are needing. When you arrive at your hotel and get settled in you can take some time to visit the many places New York has to offer such as visiting one of the largest skyscrapers in the world at Empire State Building or drop by one of America’s most famous historic structures at the Statue of Liberty. The city has something for everyone who comes for a visit whether it is your first time or you come back frequently on business. One of the city’s hot spots is Times Square which is a popular attraction for it unique broadway theaters and its variety of shopping stores along its street. If you are in town for a short visit and frequently exercise then counting the distance of your run is easy in the Manhattan area. Every mile you run north and south is about twenty blocks. Many runners enjoy running in Central Park as well. Getting around the city can be confusing for out-of-towners when it does not involve airport rides. Try purchasing the MTA MetroCard which can help get you a lift by bus or the subway. Doing this early on can make your trip easier and you’ll have one less thing to think about. Most parks in New York have free wi-fi for you to use for faster speed. So instead of sitting inside at a coffee shop you can take your coffee outside and enjoy a day of fresh air while you check your emails and get some work done. If you are up late at night and are looking for things to do or have errands to run there are many options available to you that are open 24 hours a day such as hair salons, pharmacies, sandwich shops and even bowling alleys. If you are in town and looking for local information you can go to the website for 311 for the City of New York. You can also simply text 311 NYC or by if you want to speak to someone on the phone you can just call 311. There are many options on getting to and from JFK airport to your hotel when you land in NYC. For a cheaper way to travel shared ride vans are probably one of the best ways to save. You can share your ride with others in a van that takes it passengers on a similar path towards their trip destination. There are also private vans that offer shuttle service for groups traveling together in larger numbers. These private vans have plenty of luggage space and will allow you to arrive at your hotel without any stops and combining the rates between travelers in the van. After your group gets settled in your hotel room there are many places you can visit that you can walk to or take a short taxi ride to. One such place is Central Park which offers a quick getaway from the city with picnic areas and places for families to stretch outside the busy city. The Central Park Mall is an excellent ways to kick back while you are in Manhattan which are located near popular hotels such as the The Excelsior Hotel or the Warwick New York Hotel which is a historic building built in 1926 that offers a unique experience for those wanting a day at the Central Park Zoo located only a few short blocks away. If you are looking to stay for the night in downtown New York City there are a few alternative ways to make your visit a memorable one. One hotel that you may want to consider visiting is the The Maritime Hotel near the Chelsea Market which is an added convenience if you like local shopping and need groceries. Another is the luxury NOMO SOHO hotel that offers its guests a unique bar on its rooftop so you can enjoy the open view of the city. Located on Manhattan Island the Jacob K. Javits Convention Center shuttles is nestled next to the Hudson River. This popular New York convention center has many convenient routes from the Lincoln Tunnel with easy access to the Empire State Building if you arriving at the airport. You can choose from airport limousine, taxicab services and shuttle buses that are available throughout the day with low rates and professional drivers.